Whatever your removal reason is, LaserAll will help you achieve the look that you want for your skin. Living with a tattoo that you never liked? Sick of looking at an outdated tattoo that you got when you were young? Disappointed or regretful of the placement of your ink? Whatever the reason is, if you’re ready to have a tattoo removed, LaserAll can make it happen. Laser tattoo removal is the most effective way to eliminate tattoo ink. Whether you have a tiny tattoo on your leg or an entire back piece, we want you to feel comfortable and confident when you come in for your treatment. And that means knowing exactly what the process entails. If you’re thinking about having your tattoo removed, here’s everything you need to know about how laser tattoo removal works. Everybody knows that tattoos are permanent – but not everybody knows why. Tattoo application involves the use of a needle that embeds ink particles into the dermis, the deepest layer of the skin. When the needle inserts the ink into the skin, the body’s immune system recognizes it immediately and releases phagocytes to remove the ink. Phagocytes are powerful cells that protect the body from bacteria and other foreign substances. But when it comes to tattoo ink, they’re powerless against it. The phagocytes cannot do their job – though they certainly give it their best effort. Since they are unable to remove the ink particles, the ink remains permanently trapped in the skin. But those cells don’t give up easily – they continuously try to remove the ink. And that’s why tattoos tend to fade and lose color over time. With powerful lasers, we can speed up the natural fading process. Our laser emits short pulses of light energy into the tattoo, breaking the trapped ink particles into smaller fragments. The ink particles absorb the wavelengths of the laser, and as they shatter into fragments, the phagocytes can do their job and flush them out. It requires a series of treatments to remove a tattoo completely. With each laser treatment, the ink particles get broken down further and further, making it even easier for those phagocytes to do their job. Eventually, there will be no ink left visible on the skin. The rate of success is different for every patient. Generally speaking, the stronger your immune system, the faster you’ll see the tattoo fade. Drinking lots of water and maintaining a healthy diet can help speed up the process. ​​At LaserAll, we use a state-of-the-art laser to provide advanced laser tattoo removal. Our laser ensures that you’ll receive the best results with the fewest treatments. 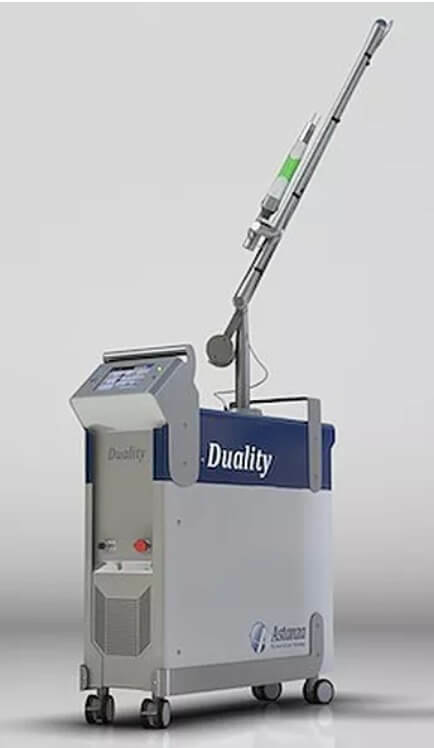 ​We use the Astanza Duality laser for all of our tattoo removals. Astanza is the leader in tattoo removal technology, and the Duality laser is used by the best laser removal experts around the world. This laser combines high pulse energies and ultra-short pulse durations, producing stronger power and better ink-shattering results. The Astanza Duality laser is explicitly designed for effectiveness on a wide range of tattoo colors. It emits two different wavelengths – each of which targets a specific group of colors. By combining these wavelengths, this laser makes it possible for us to shatter and remove ink from almost any tattoo. The phagocytes love it – the ink particles do not. Our laser is safe to use on all skin types, and it’s crafted with a square spot laser beam that requires fewer pulses than other, less effective lasers. It produces faster results, minimizes the risk of overlapping pulses, and reduces unwanted side effects, such as changes in pigmentation. Though laser tattoo removal doesn’t hurt nearly as much as getting a tattoo, many patients are concerned that the laser will cause pain. To make our patients feel as comfortable as possible, we use our laser in conjunction with the Zimmer Cryo cooling system – the most effective way to numb the skin before tattoo removal. The Zimmer Cryo cooling system blows freezing cold air onto the treatment site. It thoroughly cools the skin and can be used before, during, and after laser treatment sessions to ensure maximum comfort. It is completely noninvasive, and it’s much more efficient than using ice packs, numbing creams, or lidocaine injections. With the combination of the Astanza Duality laser and the Zimmer Cryo cooling system, we make laser tattoo removal as comfortable and pleasant as possible. Laser tattoo removal is intended to destroy your tattoo – not your budget. At LaserAll, we provide all clients with competitive pricing as well as specials and financing options. Tattoo removal prices vary depending on the size of the tattoo you want to remove. We offer free consultations so you can meet with a laser technician who can assess the size of your tattoo and quote you a price before treatment begins. Individual treatments start at $75, while packages start at $225. Interest-free financing is available with Advance Care. Our work speaks for itself. Check out these before and after photos of real clients who have had laser tattoo removal at LaserAll. Below is a list of frequently asked questions about laser tattoo removal. If your question is not listed, please call our office, and one of our experienced laser technicians will answer your question. Why should I choose LaserAll? Laser tattoo removal is an investment that takes time and commitment. LaserAll is determined to make your removal experience worth every second. Our friendly and knowledgeable staff is dedicated to each patient and passionate about body art and tattoo removal. Our mission is to help you leave our clinic feeling more confident in your skin than when you walked in. Our Astanza Duality laser is trusted by leading tattoo removal practices worldwide and is sure to eliminate more ink in fewer sessions, saving you both time and money. We have a deep understanding of tattoo removal and want to give everyone the second chance they deserve. LaserAll provides the best laser tattoo removal services throughout the Front Range. Call our office today to schedule your free consultation! Can you fade my tattoo for a cover-up? Absolutely! LaserAll specializes in all things tattoo removal. Whether you want to completely remove your tattoo, selectively remove a portion or your tattoo, or want to fade an existing tattoo for a cover-up, we can deliver. Cover-up tattoos usually need a lot of ink to completely conceal an existing tattoo, especially one that contains a lot of dark inks. Fading a tattoo down can give a tattoo artist a cleaner canvas and more flexibility with their design. Call our office to learn more about fading for cover-ups. LaserAll offers advanced laser tattoo removal treatments at an affordable and competitive price. We provide pay-as-you-go treatments and a variety of specials to help you achieve the look that you want for your skin without burning a hole in your wallet. We use a size based category system that assigns a per treatment price based on the size of the tattoo being treated. Laser tattoo removal is the safest, most effective noninvasive method for removing unwanted ink. The most common side effects are redness, swelling, blistering, scabbing, and lightening or darkening of the skin. All of these side effects are temporary and heal over the weeks following a treatment. Blisters and scabs should not be messed with during the healing process. Doing so can lead to more serious side effects like scarring. As long as patients follow proper aftercare instructions, your skin should heal beautifully. Many patients compare the laser to having a rubber band snapped against the skin. Patients may experience slight discomfort, however, the overall treatment is very tolerable. Every patient has a different pain threshold. If you’re able to withstand having a tattoo applied, you can definitely tolerate having one removed. Fortunately, laser tattoo removal is a very quick procedure that lasts anywhere from 1 to 30 minutes depending on the size of the tattoo being removed. 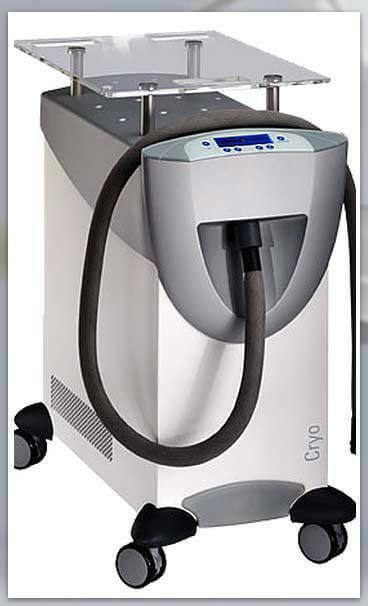 LaserAll provides superior skin numbing using the Zimmer Cryo cooling machine. This cooling technology helps numb the skin before, during, and after a treatment, mitigating any pain and maximizing comfort. Every tattoo is different and every patient heals at different rates, so it is impossible to assign a set number of treatments without first assessing a tattoo in person. That being said, most patients need between 5 to 10 treatments before seeing complete removal. Patients with older or more faded tattoos may only need 3 to 4 treatments. Ready to remove your unwanted tattoo?